Learn more about our What Waste initiative here! Sarasota’s premiere of the film WASTED! 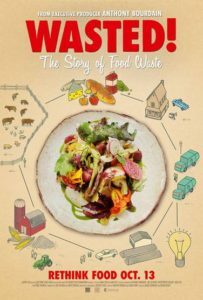 The Story of Food Waste took place on December 3, 2017 and was followed by a Q&A and delicious light bites and cocktails on the outdoor patio of Owen’s Fish Camp. The Chefs Collaborative Atlanta Local Group put on a Fall Mixer at Cooks & Soldiers last November, which included a screening of the film Wasted!, cocktails and food waste centered passed snacks. The Music Hall in historic downtown Portsmouth, NH proudly presented the documentary Wasted! in partnership with Chefs Collaborative on Wednesday, November 15, 2017. Doors opened at 6:00pm for complimentary small bites prepared by local chefs who were on hand to discuss what they are doing in their kitchens to minimize food waste. The film, produced by Anthony Bourdain, was followed by a panel discussion where panelists shared challenges and solutions from food production, distribution, grocery, home kitchen, and waste cycle. Johnson & Wales Providence‘s two biggest culinary clubs, Cooking Asia and Club of Culinary Excellence, hosted a screening of Wasted! on November 6, 2017. The film was made available to all interested students and was followed by a panel of chefs who spoke about their sustainable food practices.